1. How do I play the lesson videos? 2. Can I view the lessons on my iPhone or iPad? 3. Can I view the lessons on my Android device? 4. Are there keyboard shortcuts for the video player? 5. How do I skip ahead for the lectures that I've already watched? 8. Do I need to fully complete my user profile? 9. What are acceptable forms of payment? 10. What are the different types of subscriptions? 11. What do I receive in the subscription? 13. How do I cancel my Monthly Subscription? 14. Why am I getting charged this month? 15. I was a previous monthly subscriber, if I re-subscribe, will I have to pay $45 for the first month? 16. How do I locate my problem topic? 17. How do I download lesson slides? 18. Can I log into the Educator.com using different computers? 19. How can I ask questions? 20. Will there be more topics and features? 21. How do I become a teacher on Educator.com? 22. Are you on social media sites? Please download Educator.com iOS app from the App Store. Please download Educator.com Android App from the Google Play Store. Please follow these 2 steps to store already viewed lectures on your computer. To access your account, log in and click on your name in the top right corner. To reset your password, please visit this link: http://www.educator.com/membership/login.php and follow the instructions. You do not need to enter more specific data, but doing so makes your learning experience more valuable in the student commenting and messaging aspects of Educator. We currently accept PayPal and all major credit cards (Visa, MasterCard, and American Express). All subscriptions give you full access to all our complete library of courses. Monthly Subscriptions is $45 for the first month, and then recurring $35 per month thereafter. Half Annual Subscriptions are $180 lump sum for 6 months ($30/month) while the Annual Subscription is $300 lump sum for 12 months ($25/month). Both Half Annual and Annual Subscriptions are non-recurring. For the monthly recurring subscriptions, you can cancel any time and will be able to use any remaining time from your account. For 6-Month and Annual Subscriptions, there is no need for cancellation of subscriptions as they are non-recurring and will automatically stop after the duration ends. 14. Why am I being charged this month? The Monthly Subscription is recurring in order to ensure uninterrupted service for students. During signup, it was clearly stated that the Monthly Subscription is $45 for the first month and then recurring at $35 per month thereafter until cancel. For more details, please see our Terms of Service. 6-Month ($180, $30/month) and Annual Subscriptions ($300, $25/month) are one-time payment and non-recurring. Our current Monthly Subscription resets to $45 for the first month and $35 per month thereafter each time you cancel, even if you were a previous member who already paid the $45. Just type your problem topic into our search tool at the top of the page. You will see results with the topic highlighted and the exact times in our videos. 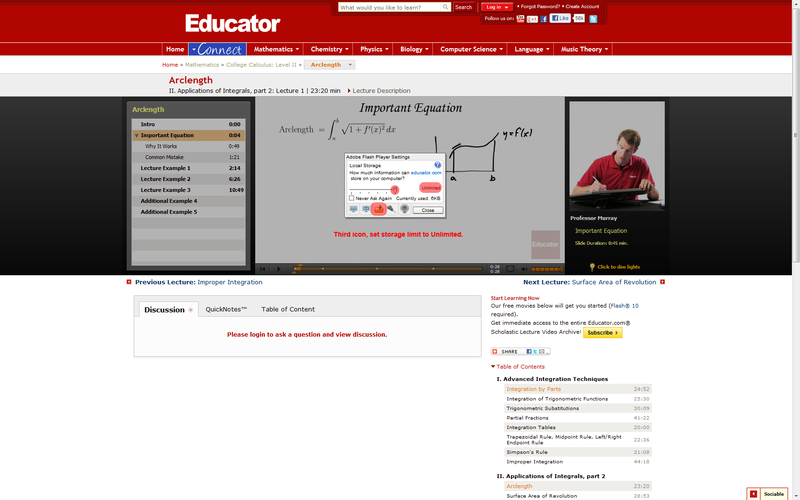 Sign in and underneath each video lesson there is a tab named "Download Lecture Slides." Left-click on the slide you would like to download and the full-sized file will save to your computer. Yes, you can log in to Educator.com from any computer with internet access. However, you can only be logged in to one computer at a time. This is the reason why many organizations buy Multi-user Licensing, because of the great savings and being able to log in many students at the same time. Please fill out your personal profile so you can participate in the student comments underneath each video. The comments section is moderated by other students as well as our instructors. Educator.com is continually adding and updating topics and instructors. Please see the Become an Educator link.